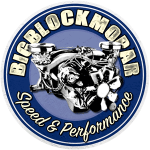 This page covers rear-axle sizes of passenger cars and pickups from Dodge, Plymouth, Imperial and Chrysler. If the current wheels have plenty of space towards the fender edge, the wider rearaxle will pose no problem. If you don’t have more then 1.5″ of space, you’ll probably need wheels with a different offset. Thanks for the input. Will mount tires tomorrow and check. If not, may sell axle to fund correct model. I hear the 71-72 axle is even more rare than the e-body models. 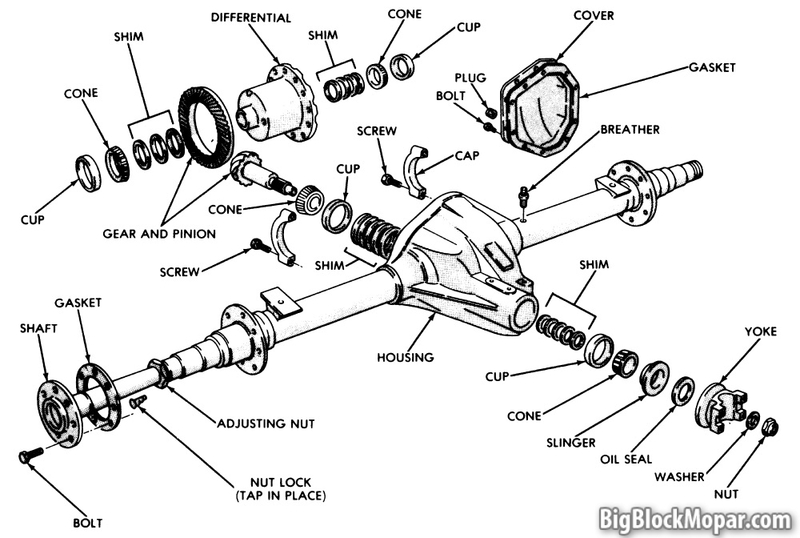 Matt i am looking for a 71-74 b body dana 60 if you still have, email me with pics and demenision. 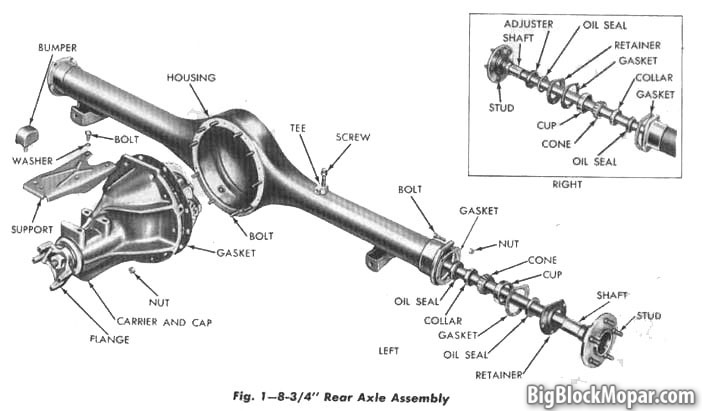 Hey, im wondering if it is a surtain way the Flange with the Nut and washer have to be set correctly in the Pinion? Example if i took it out and forgot where it should be how do i adjust it after the rear axle gear ratio, and how tight the nut should be tightned to in Foot-pounds so i dont damage the Crush sleeve. (after the last owner he took it of and i need to replace it back to its original position and tightnes) sorry for not spelling correctly. or does need a repair by a professional mechanical enginer? I HAVE A 1964 DODGE D100 1/2 TON PICKUP THAT HAS THE OLD TAPERED AXLES, THAT NEED TO BE REPLACED.CAN ANYONE TELL ME IF MY REAR HOUSING IS THE SAME DIMENTIONS AS THE 1965-1970 D100 AND COULD I USE THE NEWER AXLES IN THE HOUSING I HAVE?ANY HELP WOULD BE GREATLY APPRECIATED. You cannot use newer axles in the old housing. The bearings are different in size, aswell as the axle housing ends. I have no experience with pickups myself but I don’t think the axlewidths changed very much over the years in the ’60s. I think you should be able to swap a newer axle under there without much issues. Hi, I’m from Brazil. What’s the ring and pinion correct for differential of the Fury 1970 with engine 440?? Thank you, Ronan Toledo. Looking at a 70 B body rear end to put under my 62 Dart 440. It’s 60 1/8 wide and I want to put 275/60 r15 on American racing wheel on it. I have an 8 1/4 1977 cop rear end under it now. Also will the drive line work or do I need a different one? I have a 1967 Coronet big block car. 727 trans. I have at my disposal the stock 8 3/4 non sure grip rear and a 1978 Ford F100 4×4 9″ 31 spline axles, nontapered housing non trac lok. I don’t know wether to leave them stock, narrow them, use one over the other, and if trac lok/ sure grip can be added and which has the gear ratio I need and if that can be changed? I don’t know much really. Need help! The leaf springs have been relocated to under the frame rails, so perches will have to changed. I have 64 D100 and would like to swap out the rear end differential. Anyone know what other rear end will fit my truck? I have a 1971 charger B body with 8 3/4 differentiel! Will a 1975 Chrysler Newport C body differentiel fit the charger ? i have a 1962 dodge d100 and I’m looking for a rear end swap for it. direct bolt on if possible and suggestions? nothing wrong with the one i have other than three studs are broken off the drum and i want to eventually go disc brakes on the back later in my build. I have a 1971 Charger whit 383 4 barrel. Before the car arrive Norway ,there was put in a 2.76,whit a 742 case to replace the original 3.23. Do you now what case that would normale be in this care? 741 or 489? 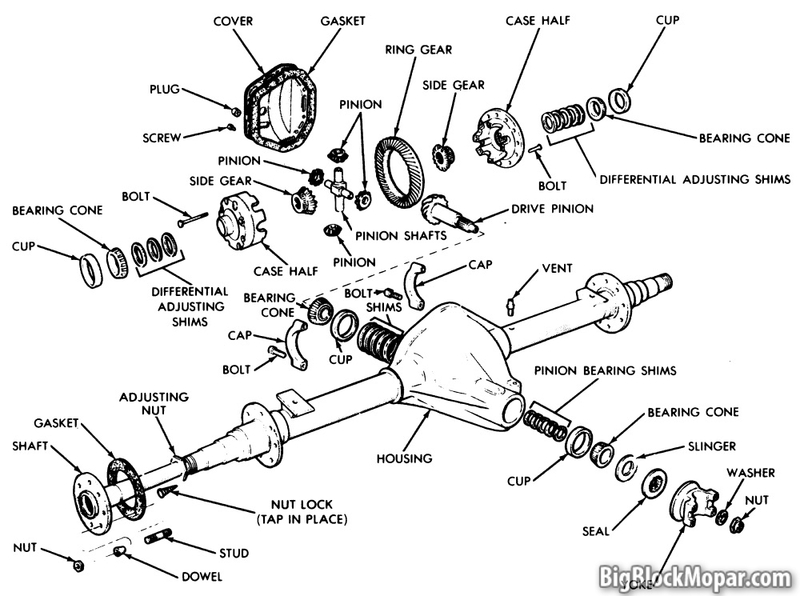 Not sure when exactly, but ’90s and newer Jeeps have discbrake rear axles, but they have mostly 4.5″ bolt circle. Which would be different from your Imperial’s larger boltcircle. Hi I am looking for a rear end out of a 72 to 74 D100 pickup or 70 to 73 c body or one out of a 69 c body wagon or a 71 to 73 b body wagon. I have an 8 3/4 rear end housing that measure ~56 1/2. Looking at the chart, it looks like it would be a 70-74 E body. The thing that had me wondering is the lug pattern. 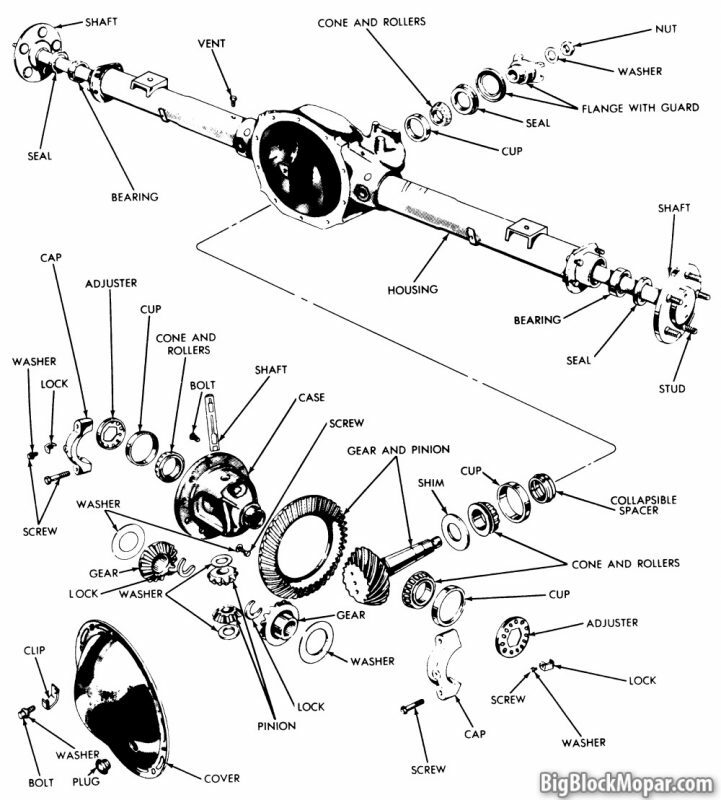 The axles that were in it had a lug pattern larger than 5×4 3/4. It came with a 742 stuffed with 2.94 gears on a sure grip. Any thoughts on what it would be from? chris I think the rear end is imperial I know in mid 60’s they were 5×5! but don’t ware springs should b. Will a 62 F100 front axle and rear Ford 9- inch work with a 65 D200. Why does the A Body year show 66-72? Didn’t they make A Body Darts/Dusters up to 76? That’s how I found the listing. I don’t know the original axle widths of the later years so it’s better to leave it out than to provide wrong information. Do you have pinion angle dimensions for B body and E body? 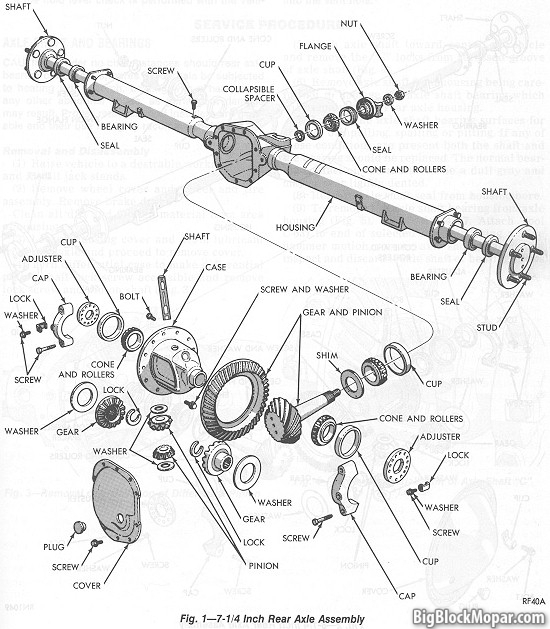 Hey hello, i have a question about rear axle for my plymouth satellite 73 400, here i have found a exploded view from the 9-1/4 rear axle. And now my question: what is the best way to separate one side of the housing from the differential. 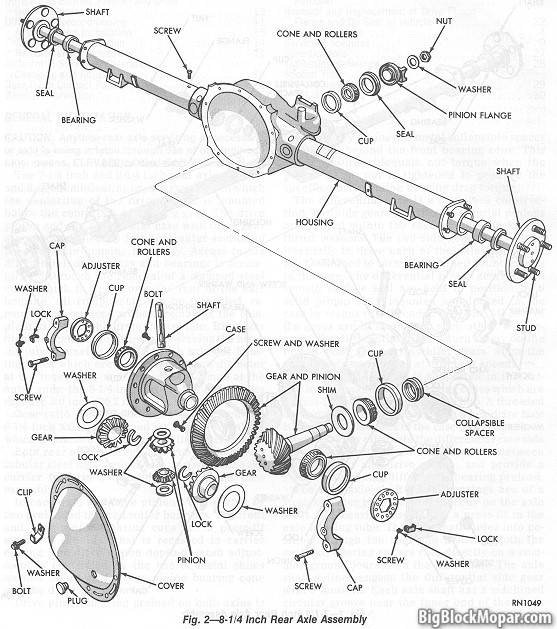 The shaft isn`t in center on the right side and i will disassemble. It would be great become an answer here by the mopar community. Yes, it is very common to move the springs to gain space for a bigger tire. They most likely sent you the wrong box back.